The user catalog allows the user to define and store own cross-sections and their characteristics that appear in a sheeting structure. At first use of the catalog (has not been yet created) the program prompts a warning message that no catalog was found. Then, pressing the button "OK" opens the "Save as" dialog window that allows to enter the catalog name and saving it into a specified location by pressing the "Save" button (by default a folder used for saving the project data is assumed). The program allows the user to create more than one catalog. The next catalog is created by pressing the "New" button - the program asks, whether the current catalog should be replaced (the currently loaded catalog is not deleted!) and saves the new catalog under a new name. The "Open" button allows for load an arbitrary user catalog and by pressing the "Save as" button for saving it under a different name. "Export TXT" button allows for exporting of currently loaded user catalog to text file. The "User's catalog" dialog window contains a table listing the user defined cross-sections. The “Add item” button opens the “New catalog item” dialog window that allows for specifying and subsequent saving of characteristics of a new cross-section into the catalog. Buttons “Edit item” and “Remove item” serve to edit individual items in the table. 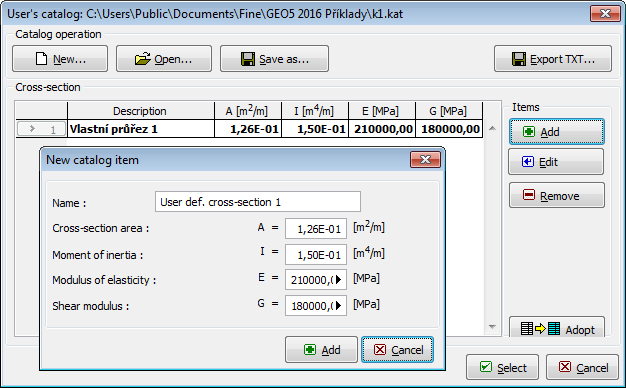 The "Accept current" button accepts the current cross-sectional characteristics of a cross-section specified in the "New section" dialog window and opens the "New catalog item" dialog window that allows for modifying and saving the current cross-section. Dialog windows "User's catalog" and "New catalog item"